On 5 March 2015, the Australian Government released the latest, much-anticipated Intergenerational Report. The report predicts changes to Australia’s population over the next 40 years, making it an incredibly useful tool for building workplace systems that are fit for the future. The data attracting the most attention in the report is focused on Australia’s ageing workforce. This got me thinking about the impact an older workforce will have on performance management. At least every five years the Government produces an Intergenerational Report to test the long-term sustainability of current policies. For Australian businesses, it’s a welcome opportunity to prepare for the future. The report specifically looks at changes to Australia’s workforce size and age profile. The HR world can use this data to predict challenges (and opportunities) in work participation and productivity levels. What will the Australian workforce look like in 2055? 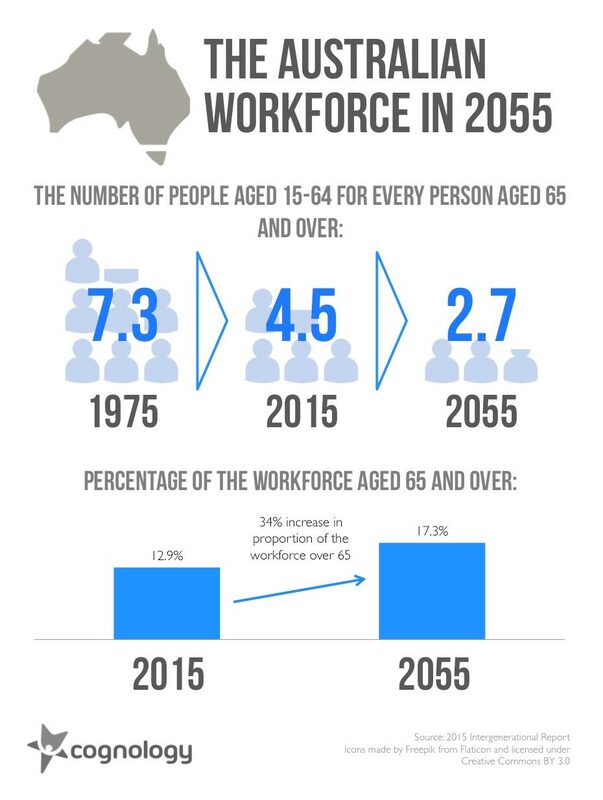 The Intergenerational Report confirms that in 2055 Australia’s workforce will have many older workers than today (the key statistics are included in the graphic above). As a result, the report anticipates a 34% increase in the number of people staying in work beyond the age of 65. Put another way, by 2055 nearly one in five members of the Australian workforce will be aged over 65. We knew the population was ageing, but this data predicts a much bigger change than many of us would have expected. As a result, it’s critical that our workplaces are future-ready for a changing workforce. As we become more experienced, and grow older, it’s natural that we may not find enjoyment in the same things or be interested in doing the same kind of tasks. Regular check-ins between workers and managers will highlight these changes before they become problematic. As a result, workflow and task allocation can be changed accordingly. Excellent talent management is all about having the right person doing the right job at the right time. The rate of technological change means that everyone needs to continually learn new skills to perform their jobs effectively. Younger generations tend to be naturally faster at picking up new skills, so developing the tech-based capabilities of older workers should be a priority to ensure their relevance in the workplace. Roles are set to become broader as work becomes more collaborative. Older workers may need to develop new capabilities to make the most of this dynamic environment. The experience of more mature workers is an excellent asset for any company. There’s a significant opportunity to utilise mature workers in coaching and mentoring roles to improve the knowledge and expertise of less experienced employees. Coaching doesn’t need to go in just one direction either (for example, younger workers could also coach older workers on technological skills). Older workers may, or may not, be motivated to climb the corporate ladder, but that doesn’t mean they don’t need feedback. Regular feedback isn’t just for long-term development: it also has a major role in improving performance day-to-day. Regular feedback has also been proven to increase engagement, decrease stress levels, improve workplace relationships and optimise efficiency. (All of which translates to higher levels of job satisfaction and healthier, happier employees). Our workforce is ageing. As a result, over coming decades there will be more people aged 65+ remaining in the workforce than ever before. It’s our job now to make sure these workers stay engaged, productive and happy at work. The fundamentals of Agile Performance Management (including ongoing feedback and mentoring) will be essential in ensuring older workers continue to contribute meaningfully, and at their highest level of performance. https://www.cognology.com.au/wp-content/uploads/2015/03/Australian-workforce.gif 210 210 Jon Windust https://www.cognology.com.au/wp-content/uploads/2017/01/Cognology-logo-colour-300x101.png Jon Windust2015-03-31 03:30:162018-08-27 11:07:55What does an ageing workforce mean for performance management? The topic of performance management for boards came up in my recent Talent Management Talk with Tania Hannath. As we talk about in the short clip below, the performance management of boards is a positive, major trend that we’re seeing across both listed Australian corporates and the Not-For-Profit (NFP) sector. In this article, I explore the growth of performance management at the board level in more detail. We start with a quick look at where this recent trend has come from, look at some hard data around the impacts, and briefly explore the similarities/differences in board-level performance management. Why have businesses started evaluating boards? In July 2014, the ASX set out additional governance principles for ASX-listed companies. The first is the requirement for companies to report on how they are evaluating the performance of their boards. 2) It gives us tangible, measurable performance indicators for board directors. How does board-level performance management work? Notice how there’s no mention of ‘managers’ or ‘employees’ above. Best practice performance management is not necessarily ‘top down’, and it’s not just for tracking performance. At its core, performance management is about ongoing improvement. That’s a goal (and a process) that all high performers should actively buy into – regardless of if they’re in the graduate program or the boardroom. It’s fantastic to see that performance management is achieving real traction at board level. As the data shows, performance management for the board as a whole and for individual directors brings great results for the organisation at all levels, and for shareholders and other stakeholders too. If your organisation has implemented board-level performance management I’d love to hear about your experience. Reach out on Twitter via @cognology. 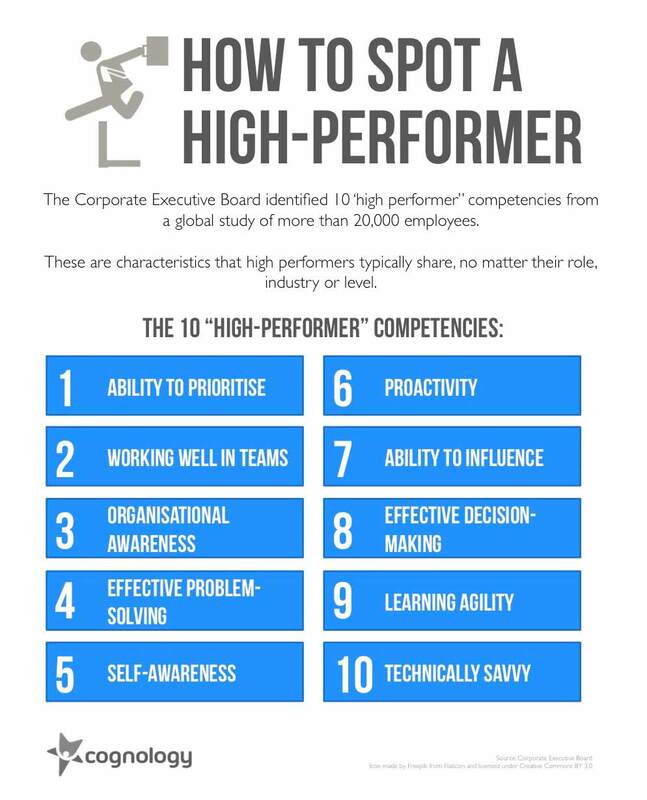 https://www.cognology.com.au/wp-content/uploads/2015/03/Why-your-board-needs-performance-management-too.jpg 210 210 Jon Windust https://www.cognology.com.au/wp-content/uploads/2017/01/Cognology-logo-colour-300x101.png Jon Windust2015-03-12 03:17:052018-08-27 11:07:58Yes, you. Even the board needs performance feedback.